Audi’s most affordable car in India recently received a slew of small but significant updates. However, one that stands out is the new petrol engine, which is smaller, lighter and more efficient too. Luxury cars are generally diesel territory, but with petrol making a strong comeback, the new engine’s introduction couldn’t have been timed better. However, does this small engine deserve a place in a car that’s quite big on price and is it actually efficient enough in the real world to be chosen over the diesel? Unlike the Mercedes-Benz CLA, the Audi A3 has always been a very understated car. The looks are distinctively Audi, but the changes in the facelift are of a blink-and-you’ve-missed-it variety. It now sports a bigger, hexagonal front grille, and a sharper set of bumpers and headlamps. LED headlights and rear dynamic turn indicators make their way into the top-end Technology variant, while the tail lights get some new internal detailing, which make the updated A3 look more sophisticated. Also, with the petrol engine now smaller, the rear badge reads 35 TFSI instead of 40, signifying the reduced performance pedigree. If you were expecting a good price to space ratio, best look elsewhere. The A3 is a driver-centric car and while there is just about enough cabin space, it’s not palatial. Seating 2 six-footers one behind the other is a squeeze, the rear seat squab offers average under-thigh support and there just isn’t enough rear headroom. In this price range, if you are looking to be chauffeur-driven, the Skoda Superb or Toyota Camry are the way to go. What does feel royal, though, is the quality. It may be a baby Audi, but stands shoulder-to-shoulder with its pricier siblings when it comes to giving you the premium experience, since everything you touch reeks of luxury. The soft-touch dashboard trim and knurled-finish media and air-con controls, in particular, feel quite upmarket. The all-black interior layout works best, but if you want something brighter, a beige-black two-tone is available too. Like we saw in the first drive, the A3 is about merging premium quality with easy ergonomics. The new three-spoke steering feels great to grip and even the mounted buttons have a tactile feel. There are 13 functions you can manage from the steering controls, but getting accustomed to which button does what doesn’t take much time. What’s also appreciable is the updated multi-media interface (MMI). The rotary dial to control the system is easy to use on the move and the displays aren’t complicated to shuffle through. A seven-inch display is now offered as standard across the range and the screen also gets a more animated interface. MMI has also been updated with natural voice recognition, which specifically makes using the navigation system more convenient. You can check out the system in action in the video review below. The infotainment display itself is retractable, but unfortunately, in our city conditions, it proves to be quite pointless. Why? Well, the parktronic system never completely deactivates, so every time a car/bike gets too close, the display will pop-up automatically to warn you about its proximity and retract again when there’s a safe gap. This proves to be an irritant in hours of bumper-to-bumper traffic, so best leave it up during daily commutes. Features like 7 airbags, a tyre pressure monitoring system and panoramic sunroof come as standard. You also get front and rear parking sensors, 2-zone climate control and rear AC vents, which, to be fair, you’d expect at this price. Surprisingly, it’s arch-rival, the CLA doesn’t get these. However, the A3 isn’t faultless either. Features like a push button starter and passive keyless entry are commonplace in cars that are less than half the price, but even the top-end A3 doesn’t get them. Additionally, the flip-key feels no different from the one you’d get with the Skoda Octavia. A person buying such a car wants it because it makes you feel special, but such oversights take away from the experience. There’s also the absence of paddle-shifters and the virtual cockpit instrument cluster, which again, you do get with the A3 in international markets. That aside, though, the A3 is fairly practical and gets a usable 425-litre boot too. There’s enough room for two large suitcases, so it’s adequate for airport runs or a quick weekend road trip. Also Read: Audi A3 Old Vs New – What’s Different? The A3’s new 1.4-litre petrol engine is what could prove to be a game-changer. It produces the same 250Nm of torque as the outgoing 1.8-litre unit, but power drops from 180 to 150PS. You would expect a 30PS drop to feel significantly different, but at city speeds, you can’t tell the old and new engine apart, save for the new motor’s quieter nature. 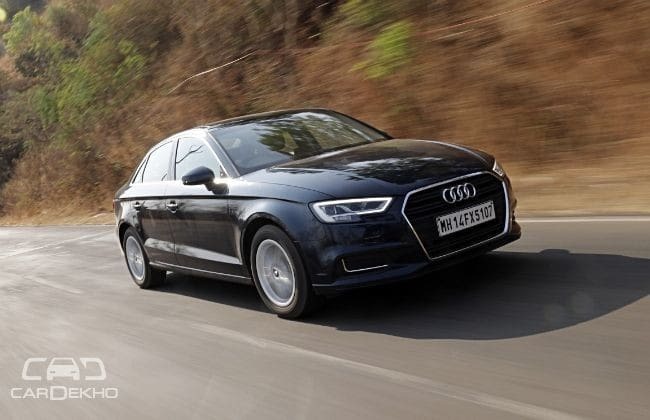 Go gentle on the throttle and you can still hit 40-60kmph quickly, so the A3 petrol is anything but a laggard. The motor is happy ambling about in the city and makes the car zippy to drive. Its refinement continues to shine even as you build up the revs, but slam the accelerator and certain differences vs the old engine become apparent. It does feel strained beyond 4,000rpm; something that became quite evident during the 0-100kmph tests. We managed a time of 8.68 seconds, which, while slower than before, is still respectable, but you find that this quick to rev motor doesn’t like to be revved all the way. To that end, the low-end torque delivery is diesel good, so getting into triple digit speeds doesn’t require hard throttle inputs. Even at a cruising speed of 100kmph, in 7th gear, the engine speed sits below 2,000rpm – similar to how the diesel A3 behaves in top gear. So should the need for a high-speed overtake arise, you still have a good share of the power band still available at your disposal before the engine is out of breath. Even swiping through trucker traffic on the Mumbai-Pune expressway was a breeze. That said, this motor lacks the vigorous mid-range punch of its predecessor and needs to be pushed a little harder than the old one did. Simply put, the smaller motor offers adequate performance, while the outgoing unit was explosive. It still packs in decent grunt, though, with a 20-80kmph time of 4.97 seconds. Credit for that also goes to the seven-speed dual-clutch automatic transmission that offers intuitive and quick gear changes. At low speeds, in particular, they’re almost imperceptible. With a light foot, the gearbox is also quite eager to upshift. If you’re feeling impatient, slipping the gear lever into sport mode will make it hold onto a gear closer to the redline and, of course, you do have the manual mode, if not paddle-shifters. The powertrain’s efficiency-focused nature helped us get fuel-economy of 13.10kmpl in the city and 18.24kmpl on the highway. In the A3, this motor also features cylinder-deactivation, which switches the 4-pot engine to two-cylinder mode under low strain conditions. The switch is seamless and will be particularly good for extending your tank range during inter-city trips, but will rarely activate in city traffic because the speeds are inconsistent. The A3’s suspension strikes a good balance of sporty and comfortable. It’s settled and composed over most Indian roads and the ride is stable well beyond 120kmph. Bigger potholes will be felt inside the cabin, though, but the suspension is still quite silent through them. The car’s composure also shows under panic braking, with the pedal offering enough feedback while we got it down from 80-0kmph in 24.78 metres. However, confidence inspiring as the car is, it’s not one you can enjoy pushing too hard. The steering still isn’t communicative enough and there’s no way of telling what the front tyres are up to. It’s light enough for city usage and weighs up adequately on the highway, but isn’t engaging to use. Given the A3’s driver-centric nature, this is one facet that should have been improved. The updated A3 petrol is not only efficient enough to give diesels a run for their money, but is leagues ahead in terms of refinement. Granted, compared to its predecessor, the A3 does lose out on some high speed punch, but it still offers impressive performance. Unlike before, it’s available in the fully-loaded variant as well. The petrol A3 isn’t just a failsafe against the ever-looming anti-diesel sentiment. It really does make a strong case to appraise over the diesel, especially considering its frugality and the lower asking price of Rs 31.20-35.03 lakh (ex-showroom Delhi).